Bose vs Sennheiser vs Sony: which are the best wireless noise-cancelling headphones? | What Hi-Fi? Bose vs Sennheiser vs Sony: which are the best wireless noise-cancelling headphones? The QC35s, Momentum 2.0 Wireless and MDR-1000X are all five-star performers, but where should you spend your money? When was the last time you had to turn the volume of your music up to drown out the train ride to work? Scratch that. When was the last time you had to turn up the volume to drown out the train ride to work, only for your headphone wire to get caught in your jacket zip? If the answer is this morning, or even last week, then the solution could be a pair of wireless noise-cancelling headphones. For a decade, Bose’s noise-cancelling headphones have kept droning transport and office hum far from you and your music. The Bose QuietComfort 35s bring wireless functionality to the range for the first time. It feels like a long time coming, but has been worth the wait. The QC35s block external noise as effectively as ever, but the headline news is the addition of non-aptX Bluetooth for wireless listening (alongside NFC for one-touch pairing). The press release for the Sony MDR-1000X wireless headphones claims they offer “industry leading levels of noise-cancelling”. That’s a bold claim for Sony’s first pair of premium Bluetooth, noise-cancelling over-ears - even a pair that made off with an Award last year. After all, they’re up against some stiff competition here. All of which is a problem for the Sennheiser Momentum 2.0 Wireless. With more affordable wireless noise-cancelling rivals, such as these, having sprung up, do they still warrant the extra spend? Both Bluetooth and noise-cancellation functionality used to come at the expense of sound quality in headphones, but that quality shortfall is ever-narrowing – as Bose, Sennheiser and Sony are on a mission to demonstrate in this three-way test. The winner will be the pair that compromises least. The oval ear cups and chunky headband that help define Bose QuietComfort signature look are back again – but design changes have been made to accommodate the wireless functionality. The power button on the right earcup now doubles as a Bluetooth pairing button – simply slide it right across to initiate pairing. You’ll also spot a NFC tag and three buttons down the side. The middle ‘multifunction’ button plays and pauses songs, answers and ends calls, and can also initiate voice commands such as Siri or voice dial. Either side of that are two volume buttons, slightly raised so you can feel your way around the buttons without needing to take the headphones off. The QC35s draw extra functionality from the Bose Connect app, which lets you manage paired devices and switch between them, change volume, see the battery status or and tell them when to sleep. While Bose’s QuietComfort headphones have long been regarded as the best noise-cancellers in the business, Sony has developed some interesting tech for the MDR-1000X to take its rivals on. Key to this are Sony’s new Sense Engine and Personal NC Optimiser, a piece of auto-calibration software similar to that found on home cinema amplifiers. The Sonys fire out test-tones to measure your ear shape and the positioning of the headphones, with the aim of delivering the best noise-cancelling (and sound quality) possible. Another key feature setting these Sonys apart is the Quick Attention mode. Place your hand on the right headphone housing while listening to music and it immediately cuts out. You can now hear what someone is saying in crystal-clear quality. Take your hand away and the music snaps back into place. It’s a smart, appealing way of interacting with the headphones. The MDR-1000Xs also offer an Ambient Sound mode, which has two settings. ‘Normal’ allows a little outside noise through, so you can keep an ear out for sirens or bicycle bells, while ‘Voice’ means the headphones focus on allowing conversations in. Switch between the two and you can hear a subtle difference in the frequencies being filtered. The outer surface of the right earpad doubles as a touchpad, with finger movements on the faux leather surface controlling music playback and volume. The earpad cover is all one material and there’s no ‘x’ to mark the centre. We struggle to find the middle on occasion and, even when you tap the right spot, the headphones don’t always respond first time. When Sennheiser launched the first range of Momentum headphones in 2013, it showed a fashion-conscious popular headphone market that style and substance didn’t have to be mutually exclusive. That is continued in the range’s wireless noise-cancelling edition. Sporting an all-leather headband, elegantly sculpted over-ear earcups on adjustable stainless-steel rails and soft earpads, the Sennheiser Momentum 2.0 Wireless look desirable. It’s fair to say they’re a touch classier than both of their rivals and, with a collapsible frame, just as portable. The partly suede headband of the Bose QC35s features leather instead of cloth material, and the cushioning underneath the band feels plumper than before. That may be to soften the effect of 100g extra weight, which is down to the wireless internals. They still feel lightweight to hold and wear though, and the familiar earpads are still some of the most comfortable in the business, providing a good and snug seal without causing any discomforting warmth. Our first impression of the Sony MDR-1000Xs is that build is on a par with these two rivals. They are smart and discreet too, with small Sony logos etched into each side and ‘wireless’ and ‘MDR-1000X’ badges on the headband. The Sonys rest on your head as opposed to clamp onto it - they feel secure and won’t slide off unexpectedly. Sony has opted for polyurethane foam to help aid the noise isolation when noise-cancelling isn’t in use. The earpads feel soft enough, but they aren’t as supple or plush as the pads used on the Bose QC35s. As you’d expect from a pair of premium portable cans, the MDR-1000Xs can fold away neatly. A substantial case is provided, complete with travel adapter, headphone cable for wired listening and micro USB cable for charging. The Boses are precise and agile, with good control and detail across the frequencies - the QC35s are a bit brighter and less forgiving of poorer kit or lo-res files than richer, more refined rivals like the Sennheiser Momentum 2.0 Wireless, though. But the Boses’ sound-sucking ability is among the best we’ve come across. It puts you in a realm of isolation you’d only otherwise experience locked in an anechoic chamber. It’s eerie to begin with, but you get used to it. The presentation is clean as a whistle, and the headphones offer a wide window into the twinkling electronics opening of ANOHNI’s Why Did You Separate Me from the Earth? The QC35s afford the demanding, bass-heavy dance track weight and punch, while managing to keep a lid on any boominess. Discipline is applied to the rhythmic side of things too, the QC35s keeping a firm hand on the patterns underlying the grubby, crashing synths that densely populate the chorus. They offer the vocals solidity and focus, even if the Sony MDR-1000Xs do a better job of conveying emotion. Stretching your budget over the £300 mark to the pricier Sonys and Sennheisers will get you even more in the way of subtlety and bass depth but, for the money, the Boses are very attractive options and easily the brand’s best portable headphone package to date. The Sony MDR-1000Xs’ noise-cancelling ability is easily on a par with the Bose QC35s (a feat unimaginable until now) and is better than the more expensive Sennheiser Momentum Wireless. They do a great job of cancelling out the drone of everyday life, whether in a busy office or on your daily commute – and with or without music playing, too. With some Bluetooth headphones there’s a slight brightness and hardness to the sound, but these Sonys are anything but. There’s a silky smoothness and sense of refinement that leaves you purring for more, and it doesn’t dumb down their dynamic ability. The Sonys manage to get the distinctive vocal in Rod Stewart’s In A Broken Dream spot on, while the David Gilmour guitar solo intro wails with as much soul and power as you could want. Drop lower down the frequency range and there’s plenty of weight, but it’s tightly controlled and measured in its deployment. Play Drake’s Started From The Bottom and the bassline plummets to an impressive depth, but doesn’t sound overblown. We’d lean towards giving the rich, weighty Sonys a better character reference here than the QC35s, which sound a tad bright by comparison. The Sonys have what it takes to show both Bose and Sennheiser a thing or two about detail retrieval, too. While the latter offer similar levels of refinement and an impressively expansive soundstage, the MDR-1000Xs open up the sound more, and fill the extra space with more detail. Purely in terms of clarity, they come out just on top. The Sennheisers feature the company's proprietary NoiseGard technology. You get a class-leading 22 hours of stable aptX Bluetooth playback with noise cancellation activated (more at a modest volume level), and the tech does a really good job of dulling down the noises of the world around you. You don’t get the almost eerie levels of silence provided by Bose’s QC35s or Sony’s MDR-1000Xs, but it feels more natural. Office racket is all but gone and airplane noise is reduced to a negligible hum. We’re greeted with the familiar Momentum signature sound, which hasn’t lost any of its verve or excitement in the shedding of wires. In fact, we’re impressed at how close the wired and wireless performance is. Things are a little tighter with the wire attached, but you certainly won’t feel like you’re missing out when you go wireless. It’s a rich, full-bodied performance with a level of composure and refinement that we aren’t always used to hearing from Bluetooth headphones. The low end is weighty but detailed, giving the pulsating bassline of Jay-Z and Kanye West’s No Church In The Wild plenty of punch without ever sounding boomy or drowning out the rest of the frequency range. Despite the strong bass response, it’s in the midrange the Momentums really shine. From vocals to guitars, there’s a level of subtlety here that justifies the extra outlay over the QC35s. In Rihanna’s FourFiveSeconds vocals are expressive and focused, while Paul McCartney’s guitar strums have real depth and texture to them. The Sonys are slightly clearer in this respect, and edge ahead with slightly better detail, but the Sennheisers hardly feel bereft. Dynamically they don’t miss a beat either, timing superbly and delivering a wonderfully enthusiastic, up-front presentation that keeps you hooked. The top end is as well judged as the rest of the frequency range, possessing an open, articulate character that shows no hint of harshness, even with lesser-quality recordings. They also offer an impressively spacious presentation for a pair of closed-back headphones, giving instruments and performers plenty of room to breathe, even in the busiest of recordings. Headphones with wireless and noise-cancelling functionality are the ultimate travel companions. 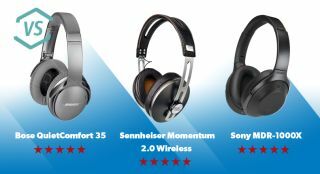 The combination was something of a rare offering when the Sennheiser Momentum 2.0 Wirelesses arrived in 2015, and by delivering a similarly impressive sound as the five-star wired Momentums, they subsequently picked up an Award. Since then Bose and Sony have joined the race, and their greater affordability has shaken things (not to mention our Awards pecking-order) up a little. The Sennheisers remain no less an attractive option for the money, with their plush build, neat controls and open, refined and transparent sound a winning combination. The Sonys build on that entertaining and insightful sound with slightly greater openness, detail and clarity – not to mention more effective noise-cancelling. The differences aren’t huge in either respect but, combined with the Sony’s lower asking price, they are just enough to take the win over the Sennheisers. Pricewise, the Sonys are nicely positioned between these two rivals. They’ll win favour with anyone who values outright sound quality - they're close enough to the Boses' asking-price to lure away some QC35 fans. In the past when Bose’s QuietComfort models have been pipped on sound quality, they’ve always had class-leading noise cancelling keeping them safe at the top of the game. Now Sony has found a way to match it for noise-cancelling, and be more sonically expressive at the same time, for only £40 more. Bose has some head-scratching to do when it comes to a successor for the QC35s. Still, Bose is heading in the right direction – the QC35s are easily the range’s best model yet – and those that can’t stretch their budget over the £300 mark are hardly ending up with a wooden spoon. Comfortable and lightweight with a generous battery life and clear, detailed and direct sound, they tick all the boxes… but ultimately they just lack their rivals’ levels of subtlety and insight.